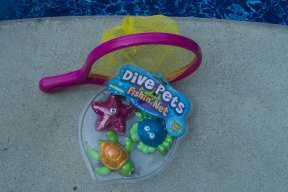 Under the Sea pool party games include diving for trinkets, rescuing mermaids and deep sea swimming through hoops. Pool games for kids need to be adjusted to their age and ability to swim. 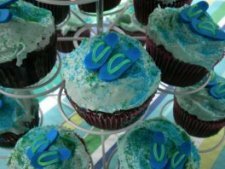 Here are some of the fun games we played at our Under the Sea Party. This Under the Sea games is for kids who can swim under water. Throw the weighted star fish, crab and turtle at a depth and distance appropriate for the swimming ability of your guests. Each guest gets a turn to go under water to collect the dive toys. Pool games for kids need to match the age and the ability of the child. This Under the Sea game works well if you have some children who are not good swimmers or are uncomfortable in the water. 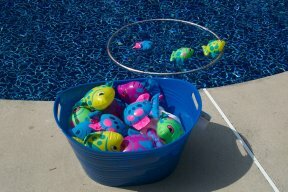 Each child is given a turn to throw 5-6 of these colorful inflatable fish into the floating hoop. The child who gets the most fish in the hoola-hoop is the winner. I purchased these tropical fish from Amazon. Even the boys liked playing mermaid games once they found out "sharks" were swimming in the pool. My 5 year old granddaughter came up with several ideas for mermaid games. The object of this game is to "rescue" Ariel from the surrounding "sharks." If a player touches or gets touched by a shark they are out or have to start over. Place the floating Ariel at a distance that is challenging, but not too difficult for your swimming guests. 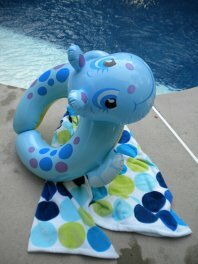 I found these weighted colorful sea horses that were the perfect dive toys for our Under the Sea party. I purchased a set of these weighted hoops that sit on the bottom of the pool. 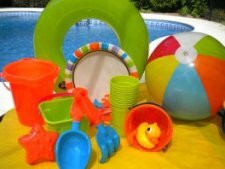 The set was from Target and was called Finding Nemo hoops. It included two hoops. 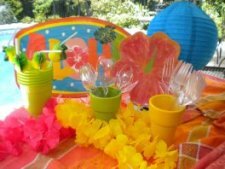 Set the two hoops at a depth and distance that is comfortable for your guests. At the end of the second hoop place some kind of treasure that appeals to boys and girls. We used colorful beaded necklaces for the girls and gold coins for the boys. Let the guest keep the "treasure" that they find. 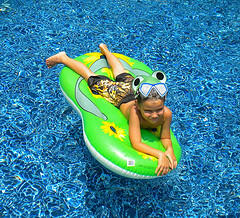 The kids loved swimming through the hoops and wanted to play this game several times.